The desolate topography of Ladakh in India has been an enigma for tourists and travelers alike. Every year, thousands of people flock to the remote land of high passes to experience its beauty and culture. While the selfie obsessed tourists with set itineraries flock the most popular spots like the Kardung La and the Pangong Lake, popular as the 3 Idiots lake; the bike riders embrace the tough roads in Ladakh to experience the high of raging their two wheeled beauties in the land often referred to as the Mecca of bike riders. Then there are the enthusiastic travelers who intend to go far beyond the obvious and explore the unknown. The contrasting landscape of Ladakh makes for a great subject for capturing images in gray scale. One thing that is probably common across every individual visiting Ladakh is the desire to capture the best of the views of Ladakh through their lens- be it with their mobile phones, the ever popular Point and Shoots or the high-end DSLR cameras. The green pastures, the snow capped peaks, mineral rich hills with multitudes of colors, high altitude lakes which change color with the changing angle of the sun rays, the bluest of the skies and the turquoise blue glacial streams look the best of their colors in the thin air against the barren landscape of Ladakh. The vibrant colors in every aspect of Ladakh make it a photographers paradise. However, the contrasting landscape of Ladakh makes for a great subject for capturing images in monochrome. Here are 15 images of Ladakh in grayscale which prove that the actual beauty of Ladakh lies in its contrasts and not just its colors. The art of marking territory with thorns and Boulders. captured at a village named Merak on the banks of Pangong Tso. The last Aryan Race: A Drokpa girl in traditional attire. Eternal beauty: Does color matter? Off to you now! 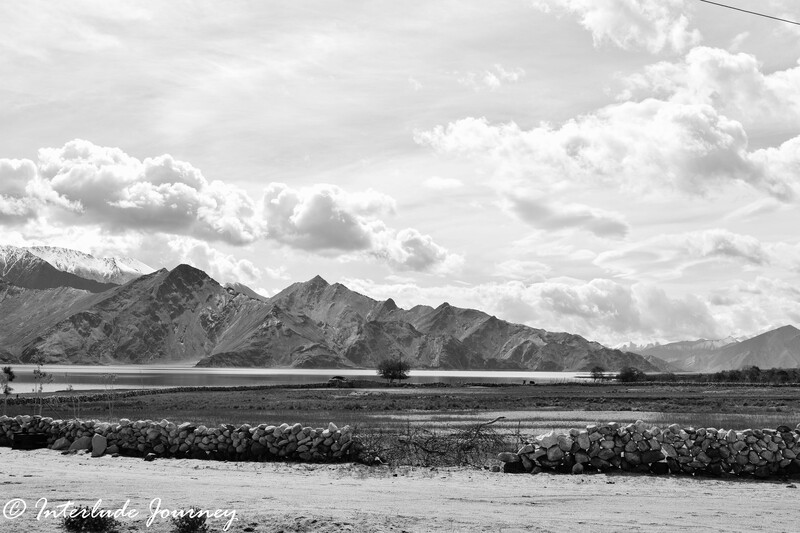 How do you like Ladakh in monochrome? Let us know your thoughts for we are all ears to know if you loved it as much as we do. Out of this world amazing! Wow, monochrome really does enhance the bareness of the landscape. Oh! it surely does. I m the pics turned out so well. Kudos to you for sharing such wonderful pictures with a different eye. Great post. Beautiful photos! Your lens did wonders! Did you shoot in black & white or changed it later? Thanks, Renuka. I processed it later. Wow.. Beautiful.. Quite a different view of the Ladakh.. thanks for sharing.. I do lots of B&W myself on my blog, and so it’s grand to see someone else who embraces the format. May I ask though: it looks like many of the photos are not filling the dynamic range available–some stop short of having any pure (or near-pure) black color, or white color. Is that delibrate? Hi Tom. Thanks for stopping by. I had a look at your photo essays and am totally impressed; especially the Alleys of Macau. I haven’t tried shooting in B&W much and this was my first attempt. About the dynamic range, I did that deliberately to avoid losing certain features in the picture. I should probably try shooting in B&W more to learn the tricks. Thanks! My own B&W work tends to be in cities–I never thought of doing much landscape work there, so I think you’ve inspired me to try it. As for the dynamic range, of course your own style is yours, but I think B&W is neat because it’s forgiving of things like graininess and black edges and some lost detail. It’s the big picture that counts. Regardless, I think you did a bang-up job on this essay here. Some of the photos, especially the one with the bridge, are quite good. Cheers then. Nature’s beauty personified. I’m not sure if you have this detail, but is this where a movie called “3 Idiots” was partially filmed? You are right Yesh. The movie was mostly shot in Ladakh and the lake in the climax scenes is Pangong Tso. Lovely frames and some of them are stunners! The gray scale really sets tone to the post. The pictures are exceptional. Ladakh in monochrome was a brilliant approach. I have heard so much about Ladakh that I can’t postpone my trip any further. I’ll probably head there in 2018. Cheers!! One of the best set of photographs I have seen in recent times. Have been to Chadar Trek but did not get much time to see Ladakh. Definitely on my list next year. Very nice photos. Black and white is such an under-rated art form, and it’s very difficult to get it to look great. Thanks for sharing! Colors don’t really matter! Great take on how to capture Ladakh. I feel like black and white photography is a lost art and you’ve captured such atmosphere in your pictures. Such a beautiful and inspirational landscape! I don’t usually like black & white pictures really, but in this post, I believe they were a good choice. Sindhu, it is just wow ! I am a big fan of colors but this monotone kept me glued to this post. Very creative idea. A little credit does go to the barren landscape of lovely Ladakh too , won’t you agree ? This is stunning! Showcasing the beauty of Ladakh in monotone is just too gorgeous!!! Ladakh is high up on my wishlist! I hope to venture there soon. Esp the picture of the Drokpa girl is just too stunning!!! Such an amazing collection of photos from your Ladakh trip. I love the stone houses and the wooden bridge too. I look forward to seeing more like this. Oh, so you have deliberately captured Ladakh in monochrome and I had thought of reminding you to change your theme! Are Drokpas Aryan in origin? The sight of the abandoned truck had a haunted feeling. Oh! I loved Ladakh and now the pictures in black and white are heart winning. The Drokpas Aryan hair accessories are awesome. I too tried hand on black and white in these amazing landscapes but couldnt capture them that well. Seeing Ladakh in monochrome gives me a sense of peace. I think most photographs in grayscale or black and white have the same effect on me though I must admit I prefer the colored versions. But yeah I appreciate these photos. I could tell the place is gorgeous! how much money did you spend ? how many days it took?